Opal, a student magician at the Keep in Sitia is having problems learning how to control her magic. Known as a “one-trick wonder” by the other students, Opal has a strong relationship with glass and glass making, but can do little else with her skills. 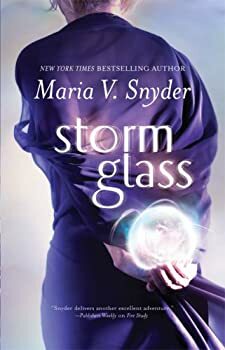 When a glass problem comes up in the storm lands, Master magician Zitora takes Opal with her to see what the problem is. As it turns out, the storm orbs that all the stormdancers use to capture the power of raging storms are breaking and killing stormdancers. Opal must figure out what is causing this to happen. In the midst of doing so, she becomes wrapped up in a much larger scheme than just the storm orbs being too brittle. Soon, Opal is caught up in a huge conspiracy and must come into her powers quickly in order to catch the bad guys and save the ones she loves. I had a mixed reaction to Storm Glass. I loved the characters — I really did. I truly connected with Opal, Kade, Ulrick, and all the others. They were well developed, and Maria Snyder did a great job writing their individual personalities. But it took me at least 150 pages to get into Storm Glass. I was confused about Opal’s flashbacks about previous torture and the death of her sister. It made me feel like there was a prequel I’d missed. Also, it seemed like Snyder could not choose one theme to stick with, and the story really jumped around. I lost count of how many times Opal got accosted and escaped. In fact, it seemed like she got out of every situation pretty easily and never had any real challenges. There was no major hurdle or antagonist, and therefore, a lack of tension or satisfying conclusion. In fact, the ending was clearly a set-up for the next novel, Sea Glass. But overall, I enjoyed Storm Glass, though it lacked a solidly unified plot. I am looking forward to reading Sea glass — I like these characters that Maria Snyder has created.